This classic vegetarian dish has its origins in northern India. It’s a warm dish of spinach and paneer (Indian-style cottage cheese) seasoned with ginger, garlic, and garam masala. Serve this with rice or naan (Indian flatbread). One pound of spinach sounds (and looks!) like a lot, but you won't believe how much it shrinks during the cooking process. Using the MultiPot Pressure Cooker you will have a healthy and hearty vegetarian meal in just about 20 minutes. This tool makes healthy cooking a snap! Blend cashews and milk in a blender into a smooth paste. Melt ghee in a pressure cooker set to Sauté. Fry cumin seeds, ginger, garlic and green chili in ghee until fragrant, about 1 minute; add onion and continue cooking until softened, about 2 minutes more. Stir chopped spinach, water, and salt with the onion mixture. Seal lid on pressure cooker and cook on High for 1 minute; relieve pressure through quick-release valve. Transfer spinach mixture to a blender and blend into a smooth paste. Stir the cashew paste, paneer, and garam masala into the spinach mixture. Paneer is a fresh cheese common in India. It is unaged and made by curdling heated milk with lemon juice or vinegar. It can be cut into cubes or crumbled. Per Serving: 322 calories; 24g fat; 12.2g carbohydrates; 16g protein; 60mg cholesterol; 1117mg sodium. First, go ahead an use an entire (small) serrano chile. Don't be shy! I've made plenty of palak paneer. I have a specific recipe I use with tomato paste. It doesn't get anywhere near my favorite versions, but it's easy and serviceable. This one is better, for sure. The cashew thing was new to me and added a fun and interesting texture I hadn't achieved before in a palak paneer. You don't have to do the whole serrano, but I highly recommend. This is a delicious vegetarian dish that Indian food lovers will enjoy! The cumin, garlic, and ginger give this classic dish a ton of flavor. The spinach is always very flavorful and savory, which we love. We serve with rice and naan bread and it's ready in under 30 minutes. I added extra ginger and garlic to this traditional palak paneer. If you've never tried it, here are two things to love: it's healthy and it's full of flavor! Served this with chicken, rice, and naan. Wasn't sure whether or not I should use fresh spinach or not, so I used frozen spinach. Turned out good, especially for my first time. this is very good, but the slow cook version (same ingredients, a little different cooking order) is deeper, richer and in my opinion, superior. delicious. Amazing! I added extra salt and heaping teaspoons of the spices. I noticed the milk and cashew mix wasn’t paste like, so I added a handful more nuts to the milk and blended them to form a paste. I also steamed the paneer in the pressure cooker in some of the left over liquid from the spinach and onion mixture before I puréed it. It’s FANTASTIC! This was nice, but what we normally do when cooking palak paneer at home is to saute onions in the pot, add ginger and garlic paste, then add tomatoes and saute till they're soft, add the powdered forms of cumin, coriander, turmeric, garam masala and then add the spinach and water. Cook as instructed for the pressure cooker, and in the end, add paneer and let it simmer for 2-3 minutes. 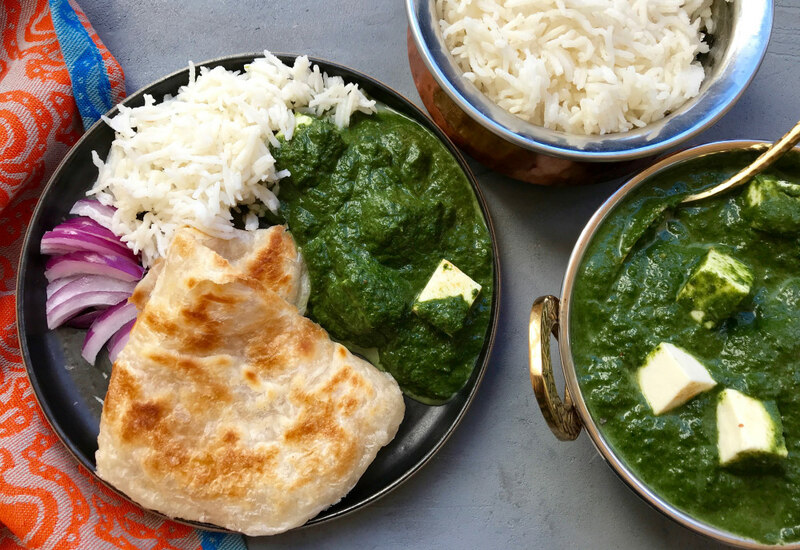 I'm Indian and although my process described here looks a lot lengthier than the recipe above, the taste of the palak paneer is as close to the traditional style my mum makes. We don't typically add cashew paste but wow, it tastes amazing! This was so easy and delicious. I don’t like spicy anything so I omitted the green chilles but otherwise, all other parts made it in and made it scrumptious! This was so delicious! Like another person who commented, I added more cashews to make a thicker consistency. I also added the garam masala the same time as the salt and didn’t wait until the end. Next time I’ll add extra chili to amp the heat up but it is really great as is.